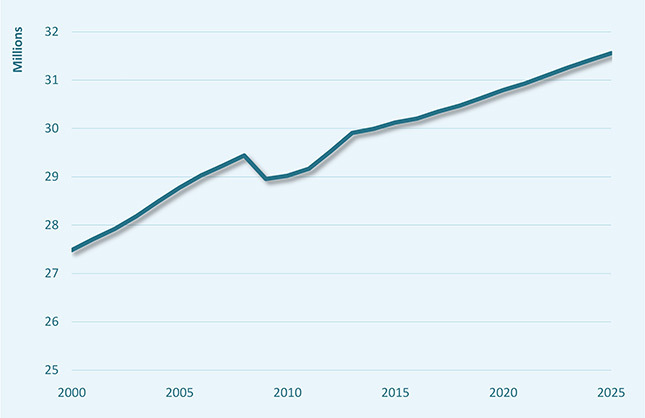 Employment passed its 2008 pre-crisis level in 2013-14 and is forecast to continue to increase. Most employment growth will be in the construction, and business and other services. Most job opportunities, around 25%, will be for professionals. Around 49% of the labour force will have high-level qualifications about the same proportion as in 2013. Following the economic crisis in 2008, the UK’s GDP started to recover in 2011. In 2013, the UK’s unemployment rate was 7.5%, well below the EU average of 11%. The European Commission forecasts GDP growth for the UK of around 2.7% in 2015 and 2.5 % in 2016. According to Cedefop’s skills supply and demand forecasts (see scenario assumptions) economic growth is expected to have positive effects on job growth and employment in the UK, which passed its 2008 pre-crisis level in 2013-14. This is much faster than employment growth forecast for the EU as a whole, where average employment is expected to reach its pre-crisis level in 2020. The effects of the economic crisis on the employment in the UK were relatively mild compared to other EU Member States. Between 2008 and 2013 there were heavy job losses in construction and manufacturing, (however, between 2003 and 2008 the fall in manufacturing employment was bigger). 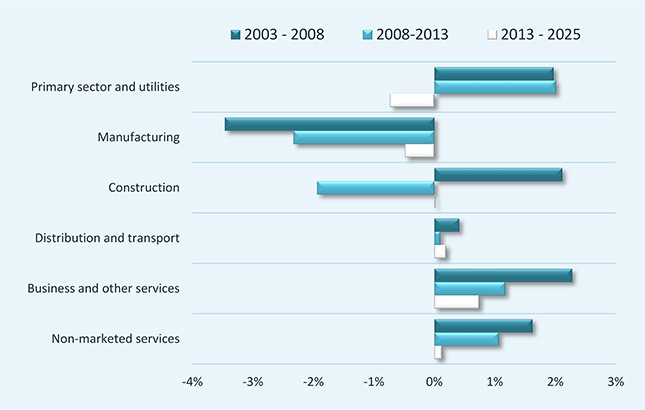 Between 2008 and 2013 employment increased in the primary sector, business and other services and non-marketed (manly public sector) services (Figure 2). The future job growth in the UK will be concentrated mainly in construction and the business and other services sectors. However, in the primary sector employment is forecast to fall. Cedefop’s forecasts give insights on job opportunities between now and 2025. Total job opportunities are the sum of newly created jobs (expansion demand) and job opportunities arising because of the need to replace people who either go on to other jobs or leave the labour market, for example due to retirement (replacement demand). 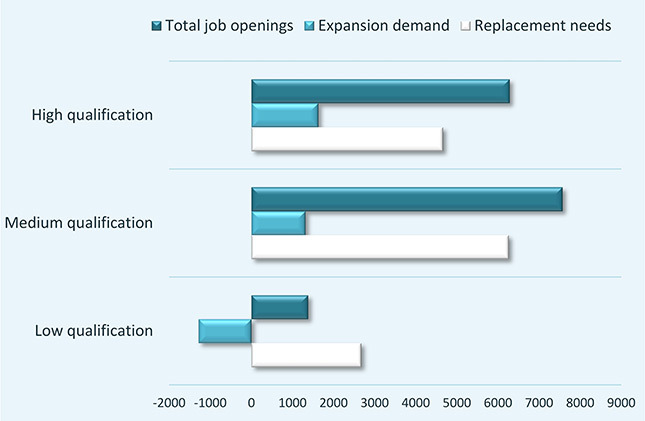 Often, replacement demand provides more job opportunities than expansion demand, which means that there will still be job opportunities even if the overall level of employment falls. Given its ageing labour force and relatively low unemployment rate between now and 2025, replacement demand in UK is forecast to provide more than eight times more job opportunities than expansion demand. In the UK, most job opportunities, around 25%, will be for professionals (high level occupations in science, engineering healthcare, business and teaching), followed by managers, around (20%). 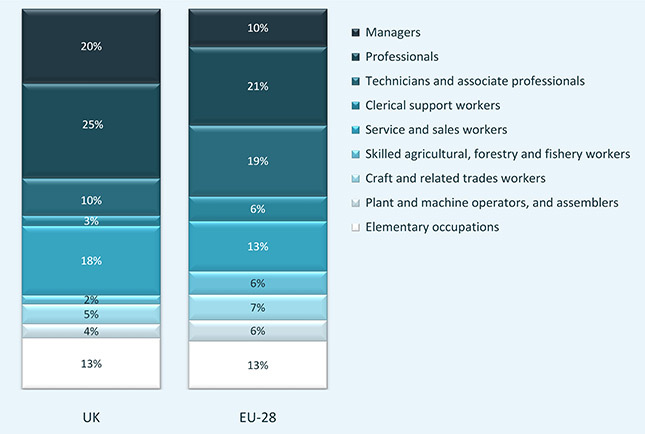 These shares of job opportunities are higher than the EU averages of 24% and 9% respectively for these occupations (Figure 3). The share of job opportunities for service and sales workers, around 18%, in the UK is also above the EU average of 16% for this occupational group. Most job opportunities in the UK will require medium-level qualifications (ISCED 97 levels 3 and 4) (Figure 4). However, there will also be significant numbers of job opportunities requiring high-level qualifications (ISCED 97 levels 5 and 6). Future labour supply trends depend mainly on demographics and the size of the working-age population (defined in the forecasts as people over 15 years old), participation in the labour force (people in the working-age population either in or actively seeking work) and how quickly people acquire formal qualifications. Eurostat’s latest population projection (Europop 2013) for the UK reflects the current trends in fertility rates and net migration flows. The UK’s working-age population is forecast to grow by about 6.5 % between now and 2025. However, labour market participation in the UK is expected to fall from 55.2% to 53.7% below the EU forecast average of 55.5%. 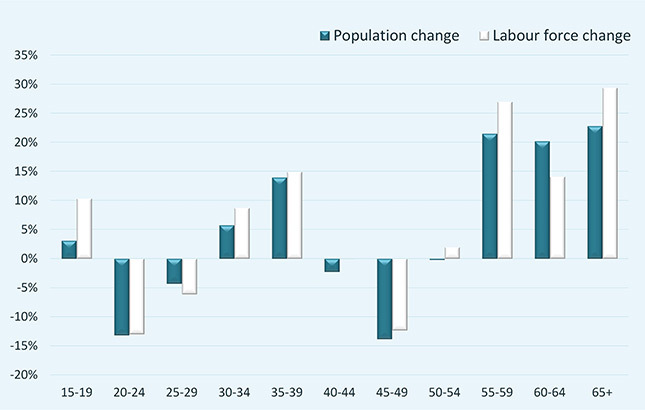 Following the EU demographic trend, the UK’s population is getting older (Figure 5). Between now and 2025, there will be an increase in numbers of people in the labour force between 30 and 39 years-old, but a much larger increase of people aged over 55. Although older, the UK’s labour force is becoming more highly qualified (Figure 6). This is explained by older less-qualified people leaving and younger more highly-educated people entering the labour market. By 2025, the share of labour force with high-level qualifications should rise to 39.9% compared to 36.3% in 2013 and 30.2% in 2005. 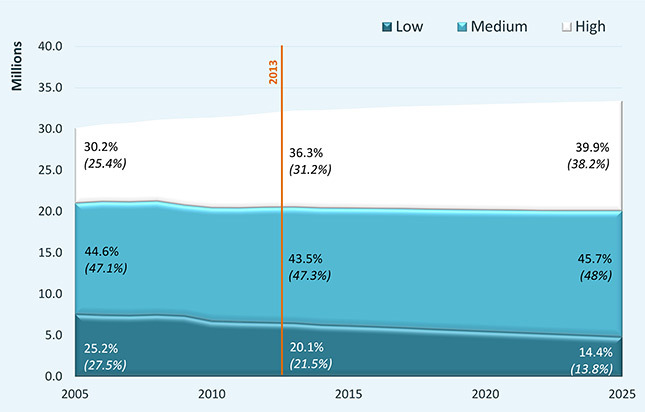 People with medium-level qualifications in 2025 will account for 45.7% of the labour force, compared to 43.5% in 2013. The share with low-level or no qualifications is forecast to fall from 20.1% in 2013 to 14.4% in 2025. According to Cedefop’s forecasts, by 2020, around 42 % of 30 to 34 year olds will have high level qualifications, just above the EU’s educational attainment benchmark of 40% by 2020. On current trends the proportion of 30-34 year olds with high-level qualifications will remain stable at around 42% up to 2025. In 2013, in the UK, 12.4% of young people left the education and training system with low-level qualifications compared to 11.9% in the EU as a whole. Both the UK and the EU have a benchmark of no more than 10% of young people leaving the education and training system with low-level qualifications by 2020. Cedefop’s forecasts and their assumptions are regularly discussed with national experts. Professor Rob Wilson, at the Institute for Employment Research, University of Warwick considers the forecasts’ underlying assumptions and its results plausible. He adds that national population projections are in line with Europop 2013. On the other hand he sees slight discrepancies between the national economic forecasts and those of the European Commission. The main differences may lie in the different vintages of the forecasts and more up-to-date data in the European Commission’s forecast. However, he regards these differences as marginal and not affecting general trends.